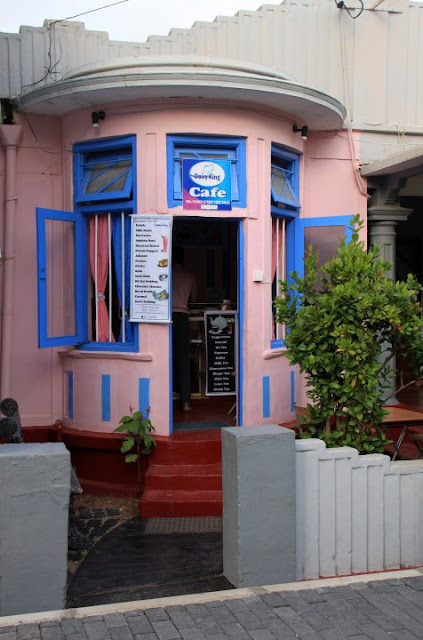 Today, while I was looking at some old pictures I had posted on my Facebook page, I came across these entries about my trip to Sri Lanka in the Summer of 2011. Since I released the blog just after that experience I had never written about it here. So I decided to repropose to you these pictures and my personal thoughts about that amazing holiday. So I think it's time for me to tell you where I've been and to show you the sweet things I've seen and tasted for you, of course (or maybe for me... I have such a sweet tooth hehehe!) 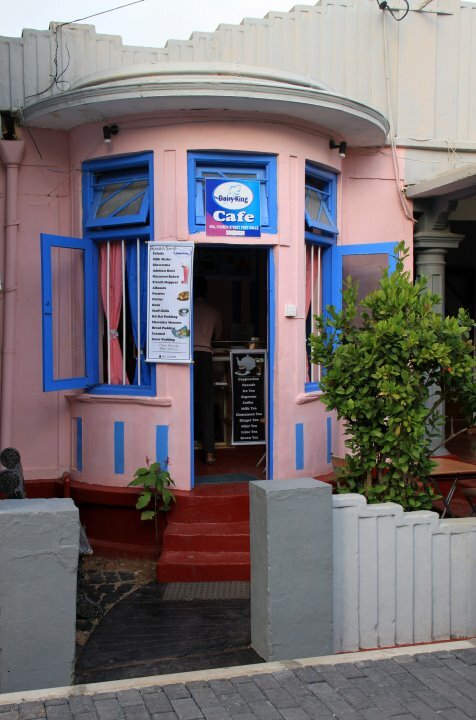 I was in sunny, friendly, colourful, spicy and exotic Sri Lanka. I have never seen so much fruit as in this country and have tasted almost all of it: mango, pineapple, guava, rabutan, dragon fruit, coconut, papaya, passion fruit, red and YELLOW watermelon (I had no idea it existed), and bananas. This picture is of my breakfast on the wonderful beach of Tangalla (@ Mangrove Cabanas). 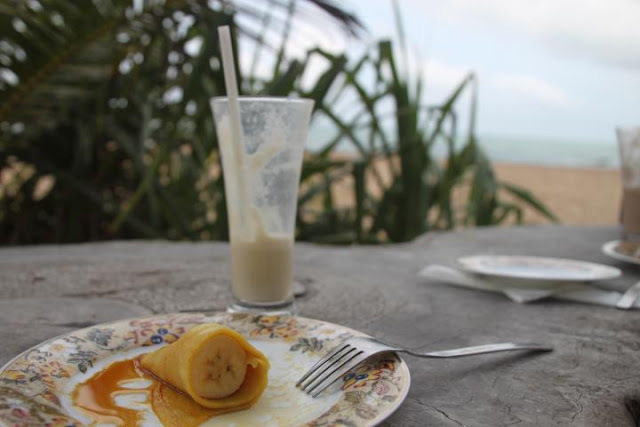 Sun, sea, sand, an old tree trunk as a table, and banana pancakes with banana milksake. Simply delicious! Still in Sri Lanka, as we where driving from Koggala to Unawatuna with a rented scooter, I just had to stop this guy and ask him to take a picture. 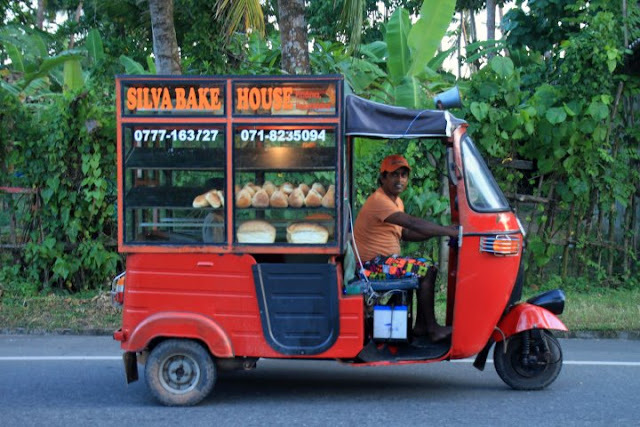 I simply love this three wheeler bakery... I am considering of buying one too and wander around the city: the Tuc-tuc sweet Bakery! The most hilarious thing about the whole scene was a Per Elisa jingle the owner played to catch the attention of the people walking by. So out of place, hahaha! It was such a refreshing treat! Although everything else looked delicious as well. P.S. : here is a series of greedy monkeys we met on the way! P.P.S. : the pictures were taken by Michael Ritter.